We spoke to the lead scientist of the new study to understand how it all works, and how the discovery may someday benefit people having twins or more. Callitrichines, or clawed New World monkeys, are a subfamily of New World monkeys native to Central and South America, which includes marmosets, tamarins, lion tamarins and Goeldii's monkeys. Callitrichines are well known for their diminutive stature: The monkeys generally weigh only 116 to 600 grams (4 to 21 ounces)! They also have claw-like nails, from which they get their common moniker. The animals typically live at the edges of the forest, where they feed on gums, fruits and insects. What really makes this group of primates unique, however, is their propensity for multiple births, which occurs because they ovulate multiple ova in each reproductive cycle. In the wild, callitrichines almost always give birth to fraternal twins (which can have different fathers), though people have also documented cases of triplets. Kjersti Aagaard, a professor of obstetrics and gynecology at the Baylor College of Medicine in Texas, has studied the reproductive habits of these monkeys. She told io9 that in captivity, triplets and quadruplets are quite common. In fact, the only callitrichinae species that's known to produce singleton births is Goeldi's monkey (Callimico goeldii). Researchers think this species had an ancestor that twinned, but that the trait was "reversed" in C. goeldii, for whatever reason. In humans and other primates, giving birth to multiples is often difficult — both in terms of the energy expended on the birthing process, as well as child rearing. On top of this issue, such pregnancies come with various complications, including premature births, low birth weights and cases where one twin restricts the growth of the other. How do callitrichines get around these problems? "From a social perspective, alloparenting is the most prominent adaptation that allows them to successfully rear multiple offspring," Aagaard said. Clawed New World monkeys live in small, territorial groups, consisting of a dominant female, a few males and a few subordinate females. The dominant female is the only one that reproduces — the other females are all reproductively suppressed, either through behavioral means or the physiological suppression of ovulation. In the wild, all adult members of the group share responsibility in raising the dominant female's offspring, including the babies' fathers. In captivity, juveniles also help to take care of their younger siblings. "It's the 'whole village' approach, where this entire troupe or extended family of monkeys rear the young," Aagaard explained. In addition to this social strategy, there are also biological adaptations that help make multiple births successful for the monkeys. "It turns out that the callitrichines are very good at building a 'good foundation to the house,' or a stable placenta," Aagaard said. In human pregnancies, only a fraction of a month goes by before the embryos start growing. By comparison, the monkeys spend almost a third of their gestation time developing the placenta, and only then do the embryos grow. This delayed fetal growth makes sure that the placenta is ready to handle the demands of multiple children. Interestingly, most callitrichines are hematopoietic chimeras, which means that the twins share placental circulation and exchange blood stem cells throughout gestation. In humans, sharing the blood circulation in a placenta can be a problem, because it often leads to one twin hogging all the blood, but this isn't an issue for callitrichines due to their carefully developed placenta. What's more, this exchange strengthens the bonds in a group — adult males cannot tell which twin they actually fathered, so they help raise both twins equally. One of the big mysteries surrounding callitrichinae is why these unique traits developed. For a long time, researchers believed it had to do with the monkeys' tiny bodies. For example, one theory proposed that the animals' diminutive size increased their risk of predation — having multiple babies helps ensure that at least one will survive to adulthood. That is to say, the small size came first, followed by multiple births. But researchers hadn't looked at the genetic bases for callitrichines' body size, birth weight or habit of obligate twinning, to back up the theory. The recent sequencing of the common marmoset genome allowed Aagaard and her colleagues to do just that. The team began by investigating 63 candidate genes, which previous studies have suggested might be involved at some level in releasing multiple eggs or controlling growth and body size. They compared those marmoset genes against those of other mammals, including other callitrichines, non-callitrichine New World monkeys, humans and sheep (which also frequently twin), to identify "nonsynonymous substitutions," or mutations that can lead to biological changes. After some "deep sequencing," they found four growth factor genes that are likely strongly involved in callitrichine twinning (GDF9, BMP15, BMP4, and WFIKKN1). Importantly, these callitrichine-specific mutations were not present in C. goeldii, the only clawed New World monkey that doesn't twin. Some of the genes have also been implicated in sheep that frequently twin. "From most of the mutations we see across the New World monkeys that we were able to look at, it looks as though they are tightly regulating growth and trying to make smaller growth rates in utero," Aagaard said. "We also think that there's more evidence for regulating growth early on across all New World monkeys, and that the twinning adaptation was able to capitalize on those restrictions to growth." Aagaard and her colleague's proposed model of callitrichine evolution. Credit: Harris et al./PNAS. According to the researchers' theory, genes that regulate the speed and extent of growth in utero were selected early on in the New World monkeys' evolutionary history, which laid the groundwork for twinning and a diminutive size. With the growth-regulating genes in play, twinning mutations popped up, followed by a developmental growth delay that protects multiple fetuses (and allows more time for placental development), a decrease in overall body size and another mutation that "refined" the diminutive size. Aagaard thinks that further investigations into the marmoset's genome could someday benefit people. For one, researchers could try to use genetic techniques to determine populations with a higher heritability of twinning. And second, they could further explore the genetic basis of callitrichine's unique adaptations, in hopes of finding ways to similarly reduce complications occurring in multiple births in humans. 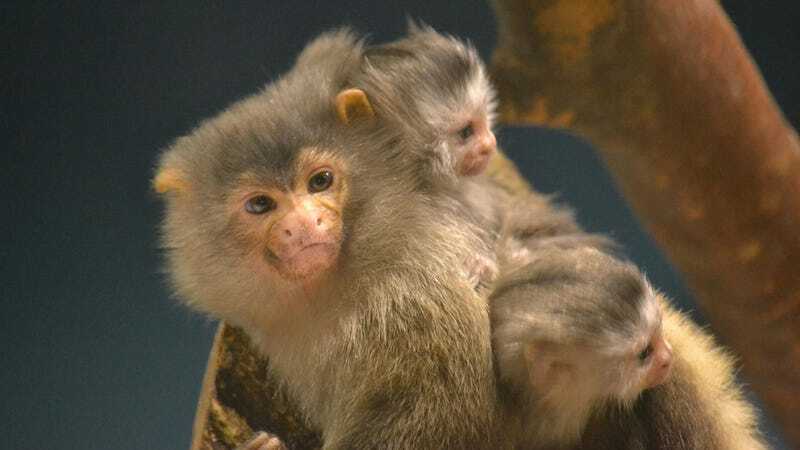 "The really interesting thing is how these marmosets invest in placental growth," Aagaard said. "We know that some of the genes are good for growth but not all of them, so we need to understand them better in order to come up with better strategies for people." Check out the full study over in the journal PNAS. Top image via tomosuke214/Flickr. Inset marmoset image via jidanchaomian/Flickr.